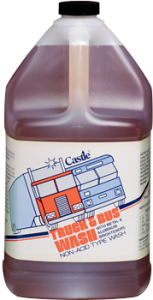 Biodegradable Castle® Truck & Bus Wash is a non-acid wash designed to be used in power sprayers. While strong enough to be diluted up to 80 parts hot water to one part product, it is safe enough to be used full strength. It effectively removes diesel soot marks, bug residue, and mild road film — leaving a clean, bright finish. 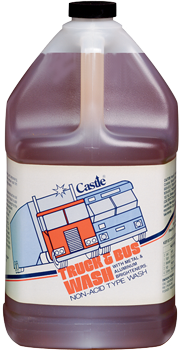 Mitting and brushing is cut to a minimum with Castle® Truck & Bus Wash. Formulated with aluminum brighteners, it works with high or low pressure in any water temperature. 1. Simply spray on and rinse off. 2. In heavy soot or dirt conditions, brush lightly before rinsing.